Here’s the deal: Electric Scooters are really becoming popular and there are now tons of models on the market. They are now more affordable and better than ever. We compiled a list of the Top 10 Electric Scooters for Adults you can find on the market today. To help you getting a great ride here are the five most important things for you to consider . Range is a measure of how far a scooter can go on a single charge of the battery. Other factors such as tire size and the terrain on which you use the scooter (hilly versus flat) will also play a role in the range you can expect from your new ride. How fast do you want to go? Understanding whether the scooter is going to be fast enough or too fast to handle is an important safety consideration. For most people, faster is better. However, safety should always be the most major consideration. We may not like talking about how much we weigh, but it is an important factor to consider when evaluating scooters. You will need to ensure that the scooter you choose has the power to effectively handle the weight of all potential riders. The type of battery is an important factor in the range of a scooter. It is also important when it comes to the life of your vehicle as well. A battery can only be recharged so many times before it has to be replaced. Where you plan on driving your scooter can make all the difference in the world. Is the terrain flat or are their lots of hills? Is the weather usually hot, cold or somewhere in between? Does it rain a lot or not? Some scooters will be better suited for different terrains which will have a major impact on safety and range. Best suited for smooth terrain and dry roads. Combining responsive power with ease of operation, the Razor E300 provides a smooth ride and is billed as Razor’s fastest electric scooter to date. The E300 utilizes a chain drive motor system that is reasonably smooth and quiet. With a top end speed of 15 MPH , the rider can easily control the speed of the scooter with the twist grip acceleration control on the handle. With more than ample torque, the E300 can handle hilly terrain with relative ease . The chain drive motor also gives the scooter swift acceleration and responsive acceleration as needed. This scooter features a wide deck on which the rider can comfortably stand. It is designed to safely handle riders that weigh up to 220 pounds. This Razor scooter also features plump 10-inch tires that provide a smooth ride for most on-road terrains . The two 12-volt rechargeable batteries are of the lead-acid variety. Boasting a 40-minute continuous ride time, the E300 can easily travel a distance of 10 miles before needing a recharge. Typical life expectancy for these lead-acid batteries is roughly five years if regularly used and charged. You will need to be mindful of leaving this scooter to sit unused for prolonged periods of time as it will cause the batteries to die. Razor offers the E300 at a reasonable price point making it an excellent value choice for localized travel on reasonably smooth or hilly road and sidewalk surfaces. SWAGTRON is well-known for its innovative approach to building scooters and the Swagger is no exception. With a frame crafted from carbon fiber , this scooter can safely hold passengers weighing up to 250 pounds. This lightweight scooter can also reach top speeds of 15MPH . It utilizes state of the art 3-speed 250-watt high-performance motor. All of that power is easily controlled by a uniquely designed handlebar that features the power button, throttle lever, brake lever and a digital display that shows speed and battery life. To ensure you get a smooth ride, the SWAGTRON Swagger features a suspension system on a motorized front wheel. This will allow you to easily navigate bumps in the road or cracks in the sidewalk as you cruise through town. SWAGTRON has also taken battery life management to a new level. With their smart battery management system, you can avoid overcharging, overheating and short-circuiting resulting in a long life for the lithium-ion battery. Perhaps the best feature of the Swagger is its ability to be easily folded up when not in use. You will no longer have to find a place to lock up your scooter as you can simply fold it up and carry it with you in the store, into the classroom and even onto a plane. That’s because the SWAGTRON Swagger is TSA compliant. With a competitive price point, durable construction and convenient fold and carry mode, the Swagger is an excellent choice for the in-town commuter that wants to have a little extra fun on the way to the office or class. Works well for on and off-road conditions. Avoid wet and muddy conditions. Boasting one of the most powerful electric scooters available, the Super 36v Turbo 1000-Elite can reach speeds of up to 32 MPH . It features a 1000-watt, 3000 RPM motor that offers two different throttle modes. You can choose Econo mode if you need to get maximum distance from your battery charge. If you want to feel the wind in your face, then you can select Turbo mode and reach maximum speeds in around 15 seconds. The Elite 1000 is comfortable on the street and the trails. Its oversize, knobby tires can handle either terrain with relative ease . You do need to avoid water and mud as this scooter is not designed to get wet. Super has equipped the 1000-Elite with an extra wide saddle seat for a comfortable ride. It also features a sturdy steel suspension with shock springs to handle those uneven road surfaces. To ensure smooth stops, this scooter has disc brakes on both wheels. You will be hard-pressed to find a scooter with this much power at the low price point of the Super 36v Turbo 1000-Elite. The first sit down scooter from Razor in our list has a classic look and feel that sets it apart from other scooters on this list. The EcoSmart Metro has a bamboo deck to go along with its powder coated frame. It even has a convenient rear basket for carrying your belongings. The 500-watt extra high torque motor can achieve top end speeds of 20 MPH while the 7-amp battery will let you cruise at this speed for about an hour . With Razor’s usual twist grip accelerator on the handlebar, you get the comfortable, easy feel that you’ve grown accustomed to from this brand of scooter. The Metro is built for comfort with its padded seats and adjustable handlebars . With its rear disc braking system, you are assured of smooth deceleration. The spoke wheels on the 16-inch tires give it ride comfort as well as a retro look and feel. The Metro is designed for around town use and is easily maneuverable in and out of traffic. It’s stable design along with the luggage rack and basket make it the perfect electric scooter for adults running errands around town. The affordable price is pretty attractive as well. Step into the next generation of scooter design with the URB-E Folding electric scooter. Made of aircraft grade aluminum , this unique scooter is as rugged as it is eye-catching. This lightweight scooter is only 35 pounds, but it is remarkably durable. It can also handle any terrain, including wet roads and puddles. Its 350-watt motor is rear mounted and provides enough power to reach a max speed of 35 MPH . And with its 36-volt Lithium-Ion battery, you can assault the roads of your urban commute for up to 20 miles. The patented folding design allows you to easily carry this lightweight scooter into the office or the classroom. With large wheels and a sturdy suspension, you can experience a comfortable ride even in your work clothes. The unique seat design sets you lower than what you would experience on a regular bicycle, resulting in a sweat-free ride. The URB-E is also built to handle the 21st-century scooter rider. In addition to its new age look and feel, it features an adapter that allows you to charge your smartphone or another device. All of this technology does come with a much higher price point however the state of the art design and features are worth every penny. As the name suggests, we have our first entry on the list of scooters that is specifically designed for off-road trailblazing. The Razor RX200 picks up where the Razor E200 left off, namely at the end of the pavement. The RX200 has off-road tires, disc brakes, and a higher torque ratio to make it ready to handle anything the rugged terrain has to throw at it. The all steel frame and lightweight fork are designed to make the RX200 sturdy enough to handle the bumps in the road. Heavy duty alloy wheels support the off-road tires for maximum comfort in the harshest conditions. If you are looking to enjoy some time off the beaten path, then you will be hard-pressed to find a better option than the Razor RX200. It has all the features that Razor is famous for including the attractive price. The Glion Dolly is designed to be the perfect lightweight travel companion. While it can handle a 15-mile commute at speeds of up to 15 MPH , its compact size and easy folding design are tailor-made to help you zip through crowds or traverse those large parking lots. The 250-watt brushless motor delivers smooth acceleration operated by a twist grip accelerator on the right side of the handlebar. Likewise, you can experience smooth and steady decelerations with a twist grip brake on the left side. The motor is extremely quiet as it does not have any chains or gears. Even though it is designed for on-road use, the Glion Dolly has all water-resistant controls. While the Glion Dolly might be designed to be a compact travel companion, it is built to last. Made of aircraft grade aluminum , this rugged scooter can handle anything the adult commuter can throw at it. This includes being rolled like a suitcase. You will also never have to worry about flat tires as the Dolly features airless rubber tires with a honeycomb-shaped interior. These 8-inch tires will give you a smooth, comfortable ride for many miles to come. While the Glion Dolly is at a slightly higher price point than other similarly equipped stand up scooters, it does offer additional convenience features that make it the perfect choice for the professional commuter or corporate road warrior. Designed specifically with the urban commuter in mind, the EcoReco M5 E-Scooter is the ultimate in earth-friendly electric kick scooters. With its silent engine and zero emissions engine, this scooter makes the perfect travel option for those of us that are out there trying to save the planet. To propel the M5, you have to manually get it up to a speed of 2 MPH then you can get the trigger throttle to engage and accelerate the scooter up to a max speed of 25 MPH on smooth surfaces. It is extremely lightweight making it the perfect portable companion. Braking is handled with an Energy Recovery Braking system (ERB). The M5 also features air-free rubber tires . These tires tend to be very durable even if they somewhat lack in comfort offered by more traditional tires. The scooter does have both front and rear suspension which goes a long way in helping to reduce vibration over rough terrain like cracks in the sidewalk. Everything about the M5 is built to be eco-friendly. Even the packaging and instructions that come with the scooter are made from recycled materials. And if you have to burn jet fuel to take a plane at the airport, the M5 is fully TSA compliant so you can fold it up and carry on your eco-crusade around the country or around the world. And with its reasonable price compared to similarly equipped scooters, you can still afford the plane tickets. The OjO Commuter is another entry on the list that breaks the mold on scooter look and feel. It features a patented design with an emphasis on ergonomics, comfort, and style. With its rounded, contoured fork and seat pedestal, the OjO Commuter will give you the ultimate in agility and ride luxury . Powered by a 500-watt HyperGear hub motor, the OjO can reach max speeds of 20 MPH . The rider can control a smooth acceleration with the convenience of the thumb-controlled throttle. Braking is handled by high-performance front and rear disc brakes. With a 300-pound rider weight capacity, this scooter uses high-end suspension components on the front and rear. You can also remove the seat if you prefer the comfort of a stand-up ride experience. The ride is further accentuated by the tubeless all-weather tires. As you have come to expect with modern age design, the OjO features a patented on-board charger with a retractable cord and plug. This allows you to plug your scooter into any 110-volt wall outlet. You can now conveniently extend your scooter commute. With premium features like what the OjO has, you can expect to pay a premium price for all the comfort and style the Commuter has to offer. Given all of its patented technologies, it’s definitely worth the price. Our final entry on the list is the UberScoot by Evo Boards and it comes loaded with technological advancements that make it unique from other scooters on the list. The UberScoot is also one of the fastest electronic scooters coming in at a blazing 26 MPH top speed . With its 1000-watt motor and chain drive system, this scooter smoothly accelerates riders up to 265 pounds. The ride is comfortable on top of the 10-inch pneumatic street tires and the front and rear suspensions. The 36-volt battery system can go up to 10 miles on a single charge. The UberScoot also features an Economy button that puts the scooter in its most economical driving mode to maximize the distance per charge. Of course, you can turn off the Economy setting if you want to feel the wind in your face at 26 MPH. The front and rear disc brakes will make sure that you get all the stopping power that extra speed requires. 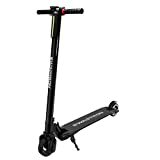 The UberScoot has a reasonable price point compared to other similar models on this list, especially given some of the innovative design features that Evo Boards has come up with. This scooter may have been that last on our list, but it definitely needs to be considered near the top of your decision making. If you have ever considered buying a scooter for a child, the primary concerns are safety and fun. The kids want to go fast, and you want them to be safe. While these factors are important when purchasing a scooter for an adult, there are several other factors that need to be considered. For starters, most adults are not purchasing a scooter to just kick around the neighborhood. They usually have a specific need in mind. Whether that is an urban commute to the office or the need to ease travel through crowded airports, a scooter needs to meet the practical needs of the adult rider. Once you understand how you intend to use the scooter, you then need to make sure it can accommodate your adult size. This is typically not a concern for children, but it is definitely a serious consideration for adults. It may be even more important if your urban commute is in a hilly city like San Francisco for example. It will take extra battery power to pull some of those bigger hills. 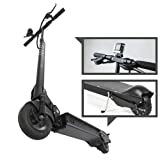 This brings us to perhaps the most important aspect of adult electronic scooter purchases, which is the range of the vehicle. Take the time to map out your routes so you know the distances you will typically cover. You will also want to see what your charging options are away from home, so you don’t run out of juice on the other side of town. Keep tires properly inflated. If your scooter requires air in the tires, then be sure to check them regularly. Low air in the tires can lead to premature wear and tear. This can also make your scooter unstable when riding it leading to accidents and injury. Don’t over charge the battery. Maximizing the life of the battery is the key to long lasting use of your scooter. Be sure to disconnect the battery from the charger when it is fully charged. Over charging the battery can damage it and reduce its useful life. Maintain the Chain – If your scooter has a chain drive system, be sure to routinely check the tension of the chain. Should the chain become loose then consider changing it. Keep it lubricated – Like any machine with moving parts, you need to make sure it stays properly lubricated. Apply oil regularly to the moving parts of the chain to ensure proper operation. As always, you will want to consult your owner’s manual for any recommended maintenance specific to the scooter that you purchase. While common sense may not be so common these days, you will want to make sure you use it when operating your electric scooter. Here are some helpful tips to remember so that you stay safe while riding. Wear a helmet – Let’s face it accidents happen and while helmets may not be the law in your state, your head will thank you for wearing one if you are in an accident. Share the road (or sidewalk) – If you are operating your scooter around pedestrians and other vehicles, be mindful of who is around you. Also, be mindful of your speed, especially in crowded areas. Don’t multitask while driving – Just like driving a car, you need to pay attention when riding your scooter. Refrain from texting and driving. Unlike a steering wheel, the handlebars on a scooter really do require two hands for safe operation. Take your time and enjoy the ride – Just because your scooter can go 20 MPH doesn’t mean you always have to go that fast. Operate at safe speeds and remember that it is always best to arrive safely, even if you are a few minutes late. Are helmets required to ride scooters? While laws vary from state to state, it is best for your personal safety to always wear a helmet. Is it best to ride sitting down or standing up? This is really more of a personal preference decision. Several factors come into play such as your personal health situation, the length of your commute and which way you feel most comfortable. 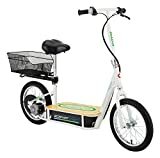 Are all electric scooters portable? Some are way more portable than others. As described above, some scooters ae designed to easily fold and be carried. Others do not fold at all but can be carried short distances if necessary. Some of the scooters referenced above are TSA compliant and can be taken on airplanes. Are there height limits on scooters? No. As long as you meet the weight requirement, height should not matter. Of course, you need to consider personal comfort and safety when operating any moving vehicle. Do all scooters come with chargers? The good ones certainly do. Also, the good ones have batteries that can be replaced if necessary. Be sure not to overcharge batteries so that they will last as long as possible. Thank you for the article. Could you say which is the fastest electric scooter?